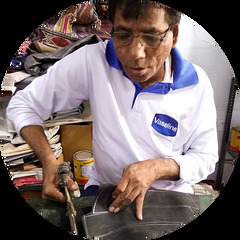 Handmade by Conserve India, these bags are all made from recycled materials, collected in the slums of Delhi. This Seat Belt bag is as described made from seat belts. They are 12 inches wide by 6 inches tall. They are lined in fabric and include a zip pocket and a zip closure. One 22 inch handle.